Lancaster senior Devin Wagner runs into a pair of Cuba City defenders during the Flying Arrows' 61–52 WIAA Division 4 regional semifinal victory last Friday night. POSTED February 28, 2019 9:51 a.m.
CUBA CITY – If you can’t remember the last time a Lancaster girls basketball team beat Cuba City in a playoff game, you probably aren’t alone. That’s because it’s been 36 years since the Flying Arrows have gotten by the Cubans in the playoffs, and last Friday night that streak came to and end with a 61-52 victory in division 4 regional semifinal action. Parents of this year’s Lancaster team were most likely the ones in high school back in 1983, when the Flying Arrows last beat Cuba City in the playoffs with a 57-50 victory in regional action. It’s no wonder this year’s team had the Cubans on their check list of teams they’d most like to beat heading into the season, along with Platteville and Richland Center. “That’s only because, with this group of girls that we’ve got, those were the three teams we just haven’t gotten a win against,” explained coach Rob Wagner. All that changed Friday night, when the fifth-seeded Flying Arrows wouldn’t be denied against the fourth-seeded Cubans. Cuba City jumped out to an early 5-0 lead on the Arrows, but Lancaster took a 15-14 lead of their own with 7:18 to play in the first half. Ironically, shortly after taking the lead, senior Devin Wagner and Lydia Murphy were sent to the bench, each with two fouls, and they remained their for the rest of the first half. At that point, Lancaster had two juniors, one sophomore and two freshmen on the floor. There was no need to take the risk, though Lancaster did give up the lead, they never trailed by more than three points throughout the rest of the first half. “The other kids played well, and we were only down three at the half, and that’s all we wanted them to do, was to keep us in the ball game, which they did,” Wagner said. The Cubans extended their lead to six points early in the second half, but Lancaster managed to tie the score at 35-35 with 11:35 to play on a 3-pointer by Wagner. The Arrows never gave up the lead from that point on, and in fact, outscored the Cubans, 12-0, in the next seven minutes to claim a 47-35 lead with just over five minutes to play. “Fortunately they didn’t shoot well in the second half, and we were able to take advantage of it,” said Wagner. Trailing Lancaster, 47-37, with three minutes to play, the Cubans played the foul game, making the Arrows earn the win at the free throw line. In the final 2:45, Lancaster made 12-of-21 free throw attempts, as Cuba City pulled as close as six points with 25 seconds to play. On the night, Lancaster made 20-of-48 (42%) shot attempts, including 2-of-13 (15%) from 3-point range. They were 19-of-32 (59%) from the free throw line, committed 12 turnovers and outscored the Cubans, 16-3 in transition. Lydia Murphy led Lancaster with 18 points on 6-of-11 shooting, while Devin Wagner added 13, to go along with a team-high four steals. Chipping in six points and pulling down a team-high eight rebounds was freshman Sophie Uppena, while fellow freshman Bridee Burks added six points, seven boards and four assists. “The kids just played really hard, and we had some kids really step up when we needed them to,” said coach Wagner. Unfortunately for the Arrows, their season came to an end this past Monday night with a 71-53 loss to top-seeded Aquinas in a regional final contest rescheduled from last Saturday night. In that contest, Wagner led the Arrows with 15 points, while Murphy and junior Brooklyn Connelly each chipped in 11. 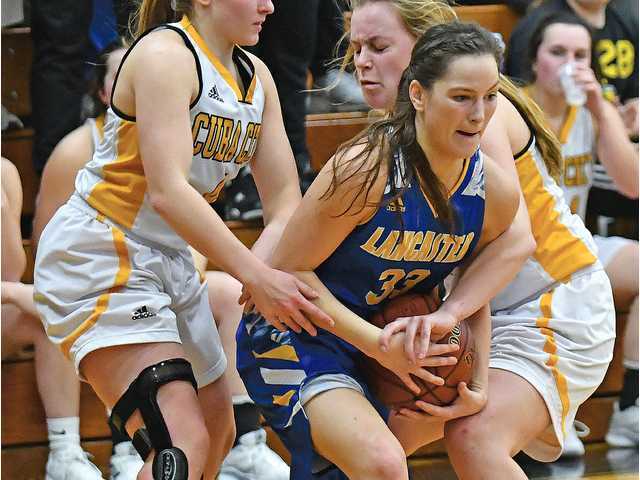 Lancaster concluded the season with an overall record of 15-8 after going 5-5 in the Southwest Wisconsin Conference to finish fourth behind Prairie du Chien (9-1), Platteville (8-2) and Richland Center (6-4). Lancaster - Bridee Burks 6, Lydia Murphy 18, Morgan DeBuhr 5, Kiley Kelly 9, Brooklyn Connelly 4, Devin Wagner 13, Sophie Uppena 6. Totals - 20-48, 19-32 61. Cuba City - Jenna Droessler 4, Elizabeth Misky 22, Courtney Busch 5, Kiera Holzemer 11, Sophia Sander 5, Madison Calvert 3, #14 2. Totals - 18-59, 10-21 52. 3-point goals - L: (2-13) Murphy 1, Wagner 1; CC: (6-29) Misky 5, Holzemer 1. Team fouls - L 17, CC 22. Fouled out - Busch (CC). Lancaster - Bridee Burks 6, Lydia Murphy 11, Morgan DeBuhr 2, Kiley Kelly 5, Brooklyn Connelly 11, Devin Wagner 15, Sophie Uppena 3. Totals - 53. Aquinas - Taylor Theusch 17, Megan Scheidt 4, Kayla Bahr 7, Lexi Donarski 25, Jacy Weisbrod 2, Courtney Becker 14, Libby Hlavacka 2. Totals - 28-68, 6-9 71. 3-point goals - L: ; A: (9-28) Theusch 5, Bahr 1, Donarski 3. Team fouls - L n/a, A n/a. Fouled out - n/a.